Kynar 500® PVDF resin-based coating is a fluoropolymer system. The key to its effectiveness lies in the carbon/fluorine bond, which is one of the strongest bonds known to man. This bond is the secret behind Kynar’s ability to defend against chemical, thermal, and UV damage. Kynar 500® resin-based finishes outshine acrylic, polyester, silicone polyester and urethane finishes across the board. It retains color longer and it resists fading, cracking, chalking, and peeling. This groundbreaking finish guarantees your roof look vibrant and withstand even the harshest weather conditions. Kynar 500® PVDF Thermobond is a textured resin-based coating that is crafted to mimic the natural tones of real wood. The stunning finish of this coating far surpasses other similar style finishes, which often have granules that are glued on. The glue degrades over time, which means the granules can easily rub off or wear away. Kynar 500® PVDF Thermobond’s granules are applied using an electrostatic process, so the texture is part of the coating. This means the granulation will last for the life of your roof; in fact, it carries a lifetime guarantee. 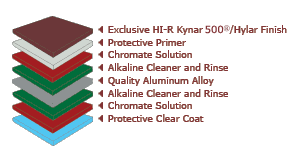 HI-R Kynar Heat Barrier finishes combine the durability of Kynar 500® with reflective pigments to produce the highest quality coating available. These pigments are able to reflect away the infrared portion of the sun’s rays that are most responsible for heat buildup. In fact, they reflect up to 46% of solar heat, meaning the attic ­– and the entire house – stays cooler. And a cooler home equals lower energy bills for the life of your roof. With high color consistency and fade resistance, HI-R Kynar 500® Heat Barrier provides all the protection without sacrificing beauty.